The New York State Museum can trace its beginning back to 1836 with the appointment of staff for the State’s first official Geological and Natural History Survey. 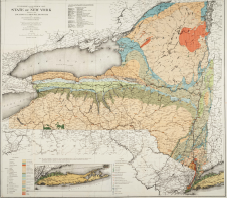 Since that point, Museum research scientists and staff have conducted "systematic investigations into the geology, biology, anthropology and history of New York" and produced a wealth of publications that detail the results of their work. Many of these publications can be found in the collection of the New York State Library and some of these publications have been digitized by the NYSL as part of the Library’s Digital Initiatives. Listed below are publication series produced by the New York State Museum that have been have digitized by the New York State Library from volumes in the Library's collection. As the State Library digitizes other Museum publications, links to the digital copy will be added to this list. The titles listed below, as well as many other Museum publications, are also available in print copy at the NYSL for use onsite or for loan, depending upon condition. Print copies may also be available for sale from the NYS Museum. For more information, contact the Reference Desk at 518-474-5355 or via email, or see the Digital Collections FAQ. Bulletin numbers 1-495 have been scanned and are available online. Each Bulletin in this series has a distinctive title. You can search by the individual title or browse through the list of Museum Bulletins. Note: Some of the Bulletins contain oversized items, such as maps. Some of these oversized items have been scanned and are available online, but others have not yet been scanned. List of Museum Bulletins with links to the digital documents. Biological Invasions in the Hudson River Basin: An Inventory and Historical Analysis. By Edward L. Mills. Circular No. 57 (1997). Earthquakes in New York State. By David H. Newland. Circular No. 14 (1933). The World of Coelophysis: A New York Dinosaur of 200 Million Years Ago. By Donald W. Fisher. Circular No. 49 (1981). The Aboriginal Occupation of New York. By Arthur C. Parker. Education Leaflet No. 1 (1948). Biological Diversity: The Oldest Human Heritage. By Edward O. Wilson. Education Leaflet No. 34 (1999). This series began with Handbook Number 1 in 1927 and ends with Handbook 19 in 1942. (Handbook 14 was reissued in 1997.) Some of the Handbooks have been digitized and are available online. List of Museum Handbooks with links to the digital documents. This series began with Memoir 1 in 1889 and was suspended in 1923 with Memoir 16. The series was renewed in 1968 with Memoir 17. Memoir 1 – Memoir 24 and Memoir 26 have been digitized and are available online. List of Museum Memoirs with links to the digital documents. In 1836, the New York State Legislature passed an act to provide for a geological and natural history survey of New York State. Survey staff were charged "to make an accurate and complete geological survey of this state…and furnish a full and scientific description of its rocks, soils and minerals, and of its botanical and zoological productions." 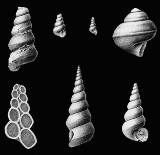 The information collected was published in six sections: zoology, botany, mineralogy, geology, agriculture and paleontology. We are digitizing a set which includes hand-colored plates. Agriculture of New York: This five-volume set by Ebenezer Emmons was published between 1846 and 1854. It includes an account of the classification, composition and distribution of the soils and rocks, as well as a view of the agricultural productions of NYS. A Flora of the State of New-York: A two-volume set by John Torrey, published in 1843, was the largest single work of its kind published at the time. The color plates are listed after each volume. Geology of New York: This is a four-part set. Part 1 is the geology of the first geological district by William W. Mather. Part 2 is the survey of the second geological district by Ebenezer Emmons. Part 3 is the survey of the third geological district by Lardner Vanuxem. Part 4 is the survey of the fourth geological district by James Hall. Mineralogy of New-York: This volume by Lewis C. Beck was published in 1842 and gives detailed descriptions of minerals found in the state with information on their uses in the arts and agriculture. Palaeontology of New-York: This monumental report on the paleontology of New York State was published by James Hall between 1847 and 1894. The set consists of 13 volumes which are numbered in eight parts. George B. Simpson assisted James Hall with volume 6, and John M. Clarke assisted James Hall with volumes 7 and 8. Zoology of New York, or the New York Fauna: A five-volume set published from 1842 – 1844. This pioneering study by James E. De Kay addresses both recent and fossil mammals, birds, reptiles, amphibians, fish, mollusks and crustaceans. The color plates in part 1 (Mammalia), part 2 (Birds) and part 5 (Mollusca and Crustacea) can be found at the end of those volumes. Part 1 also includes an historical introduction by Governor William H. Seward and a "note on penitentiaries" by the Hon. John L. O'Sullivan.